We are a specialised cladding cleaning service provider that cleans, restores, and protects your building façade, while improving the image of your property. We provide our commercial cleaning services to new modern building, retail shopping centres, distribution centres, supermarkets, office blocks, apartment blocks, service stations, warehouse, industrial and sports stadiums. We use professional environmentally friendly products and up to date modern equipment to clean cladding surfaces including coated aluminium, steel weather board panels and timber cladding, and not harsh toxic chemicals which can, in the long term, affect the surface of your building. Our specialised products and cladding cleaning services help to keep your property clean and restore all types of cladding to their pristine conditions. The products are non-abrasive and compatible with powder-coated, plastic-coated, or anodised aluminium panels. Our facade cleaning services will increase sales or leasing opportunities of the property and prevent dilapidation claims. Click here to find out more about how to clean cladding. 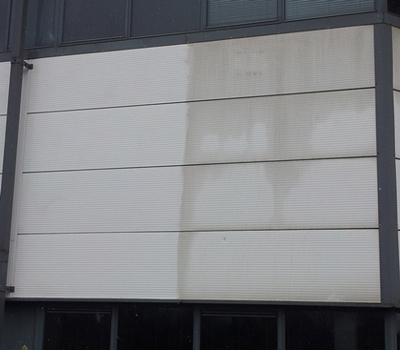 K-Render Cleaning as with all metal cladding the external walls of our commercial and industrial properties can take a battering from the wet and windy British weather, causing excess algae and moss on these surfaces. Choosing the wrong non specialist contractor ,equipment or cleaning methods can lead to discolouring or even permanent damage to the surface of the building render, leaving more of an eyesore than the actual growth which was being removed. 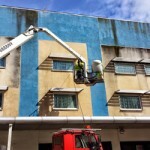 Property owners and management companies are well advised to employ the services of a specialist render cleaning company in order to ensure that damage and further staining is not incurred. At APT-ICC we are highly experienced in all commercial building cleaning methods the most efficient and effective way to remove algae and moss from a building without causing damage to the render. 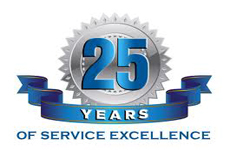 At APT-ICC, we have a proven track record in removing algae and moss from rendered surfaces, first treating the outside walls and then finally cleaning the building down with our specialist, soda blast cleaning and low-pressure super heated washers removing algae stains or marks.